Is it snowing in Veysonnaz-Printse ?Thank you! The snow forecast for Veysonnaz-Printse is: Some drizzle, heaviest during Fri night. Mild temperatures (max 5°C on Sat afternoon, min 1°C on Fri morning). Wind will be generally light. Veysonnaz-Printse Weather (Next 3 days): The snow forecast for Veysonnaz-Printse is: Some drizzle, heaviest during Fri night. Mild temperatures (max 5°C on Sat afternoon, min 1°C on Fri morning). Wind will be generally light. Veysonnaz-Printse Weather (Days 4-6): Light rain (total 7.0mm), mostly falling on Mon afternoon. Mild temperatures (max 6°C on Wed afternoon, min 1°C on Mon morning). Wind will be generally light. Light rain (total 7.0mm), mostly falling on Mon afternoon. Mild temperatures (max 6°C on Wed afternoon, min 1°C on Mon morning). Wind will be generally light. Some drizzle, heaviest during Fri night. Mild temperatures (max 5°C on Sat afternoon, min 1°C on Fri morning). Wind will be generally light. The above table gives the weather forecast for Veysonnaz-Printse at the specific elevation of 2315 m. Our sophisticated weather models allow us to provide snow forecasts for the top, middle and bottom ski stations of Veysonnaz-Printse. To access the weather forecasts for the other elevations, use the tab navigation above the table. For a wider view of the weather, check out the Weather Map of Switzerland. The reviews are out of date; a new fast 8/10 person gondola has been installed at piste de l'ours for the 2016 season to add to the swift Veysonnaz gondola. Slopes are well groomed, queues non existent, weather sunny 300 days a year (I have never not had a sunny ski holiday here in 10 years). Mountain restaurants, such as that at the Combatselin lift, have good food and fantastic views. The butcher, baker and supermarket ensure self-catering is easy. Well integrated transport via train then post bus from the airport; no need for a car. Flights to Milan or Basle are cheaper than Geneva. 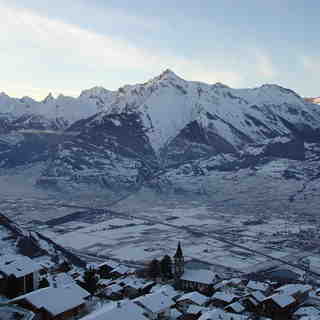 The Veysonnaz-Printse skiing weather widget below is available to embed on external websites free of charge. It provides a daily summary of our Veysonnaz-Printse snow forecast and current weather conditions. Simply go to the feed configuration page and follow the 3 simple steps to grab the custom html code snippet and paste it into your own site. You can choose the snow forecast elevation (summit, mid-mountain or bottom lift) and metric/imperial units for the snow forecast feed to suit your own website…. Click here to get the code.